Ms Ali is definitely one of the most controversial author I have ever encountered in my adult life. I did not read her first book The Caged Virgin, but I did read Infidel and Nomad. Nomad will be discussed in another post. The first time I saw Ms Ali was on CNN International, where she was invited to speak opposite the famous Tarik Ramadan. The intensity of the debate shocked me so much that I was compelled to buy this book. So here we are, Infidel, the title in itself is quite dramatic. But First as usual, a word about the other, Ms Ali is a Somali born, dutch writer and politician who is known for her views against Islam. She is also a feminist and atheist activist. She is the founder of the women’s rights organisation the AHA Foundation. Ms Ali wrote and co-directed with Theo van Gogh, the movie Submission, after which her co-director was murdered. Her father was an opposition leader in Somalia. 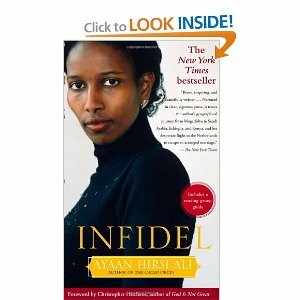 Infidel is her memoir and her journey from being a muslim to an atheist. The book started when she was a 5-year-old Somali girl leaving in Mogadishu with her family. Somalia was a peaceful place then. Her childhood was quite normal, until she and her sister was victim of female genital mutilation. It was done without any proper care. She ended up having an infection and could have died. This is a very common practice amongst Somali people. Hence, Ms Ali has set-up a foundation to documented and advocated against such practice in the US. Where I don’t agree Ms Ali is when she linked this practice to Islam. I am from a muslin country myself. Technically, Senegal is a secular country where 95% of the population is muslim and 5% are christians. But for the sake of this argument, we will call it a muslim country. In my country, Female genital mutilation is not a common practice dictated or influenced by Islam. Only some minor ethnic groups in the south and east still practice it today. I agree with her that we need to deal with this issue in a swift manner but I don’t buy the link with Islam. Moreover, this was never a problem in arab countries. When I was in secondary school, we use to have whole presentation on the consequences of this practice. Students was advised to report their families to the school if they were forced to undergo it. Different places, different experiences. I am sure in Mali, the country just next door, it’s different. The story moved on to the period where the dictator Siaad Barre came in power and the decent into hell started. Somalia became the place we know it to be today. In this book, we get to learn a lot of about Somali culture, tradition and clan. As a west african, tribe and clan are relatively important to us. In Somalia, the clan you belong to is everything. Later in the book, she left Somalia, for Germany and finally Holland where she became a politician after graduating from University. Some parts of the book are amusing, other parts are heart-breaking. As they say, the rest is history. She went on criticizing Islam in public, made a movie against Islam and her co-director got killed. She went into hiding, then in exile and finally was expelled from the government and from Holland altogether. She now lives and works in the US. Before I continued on the book, allow me to touch on the movie quickly. I sincerely felt that the idea was a good one. It is true that muslim women are victim of abuse – most then others? Sincerely, I don’t know. I will argue WOMEN, muslim or not, are victims of abuse everywhere in the world. The case of Somali women seems to be worse though. The movie showed a group of women. Each women tell her story of abuse while the supposed corresponding verse of Quran is written on her naked body. You can imagined the stir it has created all over the world. As I said earlier in this post, this book is really controversial all the way through the end. I agree with some parts of it and I disagree with some others. For example, Ms Ali does a lot of generalization. She believed that Islam is a backward religion who had caused a lot of problems to women. I beg to differ. Women had problems before Islam. But it is true that Islam have added a new set of rules to their lives that did not help them. I admire her resilience and her desire to succeed. She was a runway bride when she arrived in Holland and less than ten years later, she became a public figure and a politician who influences the lives of millions of people. On immigration, I disagree with her as well. Being an immigrant myself, I can assure you that when you arrive in a new country, the first thing you do is to look for your countrymen. So I don’t buy into the idea that because of the values of the country where you are in, you should live in a civilized manner, whatever that means. But for their own success, immigrants should use all necessary means to integrate their new societies. The only issue that I have with her is that she worships the west and their ideas. The way people are allowed to speak freely, to do as they wish, to worship the God they want, to live their lives the way they wanted. One should not compare an egg and an apple. Somalia and Holland are two places completely different. I don’t see why she should or would compare them. I supported the transfer of the savoir-faire, but to say that you religion, your country and your God are not good at all. But those of the west are, based on your personal experience is a bit strong in my opinion. Of course some of the things she said are true, let’s not kid ourselves. I recommend you this book, it will give you a new perspective. It is the kind of book that challenge your fundamentals ideas and beliefs. I really appreciate reading a different perspective of Islam, women, Somalia and the West in general. The best thing about this book is that you will never be able to discard the author as a lunatic. Her actions are sometimes outright crazy but you won’t help but like and admire her for her courage. Did you read this book? What did you make of it? As always, you can send your views by email at utneemtree@gmail.com or comment under this post.